Documentary has undergone a marked revival in recent art, following a long period in which it was a denigrated and unfashionable practice. This has in part been led by the exhibition of photographic and video work on political issues at Documenta and numerous biennials and, since the turn of the century, issues of injustice, violence and trauma in increasing zones of conflict. Aesthetically, documentary is now one of the most prominent modes of art-making, in part assisted by the linked transformation and recuperation of photography and video by the gallery and museum world. Unsurprisingly, this development, along with the close attention paid to photojournalism and mainstream documentary-making in a time of crisis, has been accompanied by a rich strain of theoretical and historical writing on documentary. 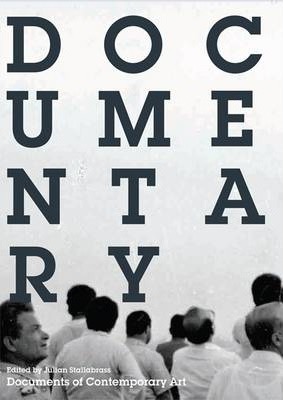 This anthology provides a definitive historical context for documentary, exploring its roots in modernism and its critique under postmodernism; it surveys current theoretical thinking about documentary; and it examines a wide range of work by artists within, around or against documentary through their own writings and interviews. Artists surveyed include: Kutlug Ataman, Ursula Biemann, Hasan Elahi, Harun Farocki, Omer Fast, Joan Fontcuberta, Regina Jose Galindo, David Goldblatt, Alfredo Jaar, Emily Jacir, Lisa F. Jackson, Philip Jones Griffiths, An-My Le, Renzo Martens, Boris Mikhailov, Daido Moriyama, Walid Raad, Michael Schmidt and Sean Snyder. Writers include: James Agee, Ariella Azoulay, Walter Benjamin, Adam Broomberg, Judith Butler, Oliver Chanarin, Georges Didi-Huberman, John Grierson, David Levi Strauss, Elizabeth McCausland, Carl Plantinga, Jacques Ranciere, Martha Rosler, Jean-Paul Sartre, Allan Sekula, Susan Sontag, Hito Steyerl and Trinh T. Minh-ha. Introduction; Origins and Definitions; Conventions; Does Documentary Exist? ; Photojournalism and Documentary: For, Against and Beyond; Active and Passive Spectators; The Limits of the Visible; Documentary Fictions; Commitment; Biographical Notes; Bibliography; Index; Acknowledgements. Julian Stallabrass teaches Art History at the Courtauld Institute of Art, London. His books include Gargantua: Manufactured Mass Culture (1996), High Art Lite: The Rise and Fall of Young British Art (1999) Internet Art: The Online Clash Between Culture and Commerce (2003) and Art Incorporated (2004).